A workshops series designed for those who have already taken part in Betty's Introduction to Drawing workshop, or have some previous drawing experience, and want to further develop their skills. Here's your chance to explore and develop your drawing skills more fully, with guidance from an experienced artist. 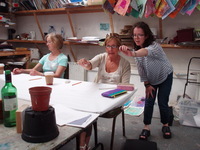 In a relaxed series of workshops, with step by step instruction. Betty Gannon studied fine art at GMIT and works mainly in drawing, painting and 3d work. She has exhibited her work throughout the country including solo shows at the Linenhall Arts Centre, Watergate Theatre Gallery and the Alley Arts Centre. Her work can be found in several private and public collections. She is also a visiting artist to various National Schools in Co Mayo. Drawing for Adults Follow On Workshop takes place over four Friday afternoons commencing 24th Jan, from 11.30am-1.00pm (continuing 31st Jan; 7th and 14th Feb). Cost per head for the workshop series is €40. Participants will be required to bring some of their own materials, these will be outlined in the first class. There are twelve places available and booking is ESSENTIAL.